The cart in Halo: Reach. The Cart is a human civilian transport vehicle. It resembles a luggage transport at an airport, having a yellow color and being attached to some other, non-drivable carts. It is mainly flat, with a small railing on top. The vehicle is drivable in Halo Reach and can be found during the level ONI: Sword Base, early on. It can only be used in the courtyard, and cannot be taken to the next area. However, during the end of the mission, the cart can be taken into the base. 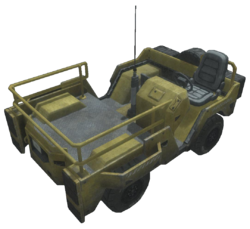 Like all other civilian vehicles in Reach, the cart is weaponless and is mainly there for fun. During co-op, players can stand on the cart without being killed at full speed. At full speed the Cart is capable of splattering enemies in Easy and Normal modes, however only Grunts can be killed with it. A Jackal or an Elite will merely be damaged. This is not possible on Heroic or Legendary. A preview of the cart in Halo 3. Rear view of the cart from Halo 3. Front view of the cart from Halo 3. Side view of the cart from Halo 3. Concept art of the cart for Halo: Reach. A high-poly render of the cart for Halo: Reach. A low-poly render of the cart for Halo: Reach. The cart in Halo: Reach, in-game.